It was windy last night, very windy. I went out to check, and he was right. The wind had coincided with the recycling collection, and people’s recycling – hoarded for the last fortnight – had escaped. Plastic bottles were dancing around with wild abandon, while the recycling boxes were chasing each other down the street. There are many reasons to worry about plastic – whether resource efficiency or the use of fossil fuels contributing to climate change. But, as a biodiversity organisation, our concern is the impact of plastic on the wider environment, and particularly on life in our seas. That’s why we’ve been working on microplastic pollution for the last seven years. So what can be done? We are delighted to see a proliferation of initiatives to act on plastics, but how will these help to prevent its escape into the wild? It’s overwhelmingly clear that at a global level we need to reduce plastic use, and particularly its ongoing production. We can’t manage the plastic that already exists, and the more we use (by a law of averages), the more will escape. We know that on-the-go, disposable items (such as bottles) dominate debris found in beach surveys in Europe, and thus need to be reduced. 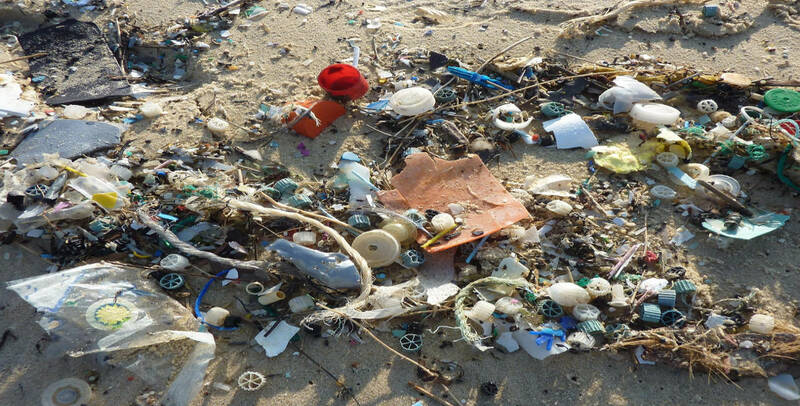 However, more widely around the world – and particularly in Asia (the source of 80% of marine plastics globally) – a wider range of plastics are reaching the sea, as a result of less effective waste collection and management systems. We need global solutions to address this, changing the global supply and packaging approaches that will otherwise overwhelm waste collection systems in these countries. We need to pull together to reduce global plastic use, as a key part of turning off the tap on ocean plastics. Part of the solution to reducing plastic use will be finding other materials to serve the same purposes. Sometimes plastic use is clearly unnecessary, and at times even inexplicable. However where plastic does perform a clear function, suitable alternatives may not always be obvious. From a biodiversity perspective, biodegradable plastics and bioplastics are not the solution – they behave the same as any other once they reach the sea. Also, in seeking alternatives, we need to look at other potential environmental consequences in terms of increased natural resource use, increased food waste or increased carbon emissions. There is a case to be made for ‘sensible plastic use’, once all other alternatives have been considered, and assuming it can be managed responsibly. We are less likely to allow resources we value properly to escape from the system; for example, if we drop money in the street we stop and pick it up. We must value the plastic we already have, and use it responsibly. We have a mountain of plastic we need to do something with (and shipping it to countries less able to cope with it cannot be an answer). If we don’t use this plastic, the alternatives are incineration or conversion into novel fuel sources – which may get rid of the plastic, but can leave toxic residues. Using plastic wisely means recycling it multiple times. But for this to work we need to value recycled plastic more highly – it needs to have a premium to drive a recycling economy, and we need commitments across the board to use recycled material in new products, wherever possible. In reality this may need statutory requirements for minimum recycled content, increased producer investment in recycling and perhaps even rebalancing of taxation systems to favour recycled over virgin plastic. Any recycling scheme is only as good as the collection rates – for example only 57% of plastic bottles reach UK household recycling systems. Incentivising collection is a good way to avoid plastics escaping to the environment; one such example is the deposit return scheme recently proposed for bottles in the UK. This suggestion does have its critics, who are concerned that such schemes risk siphoning off a valuable source of recyclable plastic from mainstream recycling collections. However, elsewhere, these schemes have achieved well over 90% return rates for bottles – thus reducing the potential for escape of a key component of marine litter. Furthermore, these schemes have incentivised a waste-picking culture – this plastic has a value that makes it worthwhile to pick up. Just think, I could have made myself a bit of money this morning! Ideally of course, we wouldn’t need to incentivise people to pick up rubbish. It’s heartening to see the embracing of beach cleans and the new trend for ‘plogging’ (picking up plastic waste whilst jogging), while in Rwanda there is a government led litter pick every month. Keeping plastics out of our ocean is a global challenge. But with the range of complementary tools at our disposal, we could go a long way to turning the tide. This blog post was originally published by FFI on 22/02/2018.